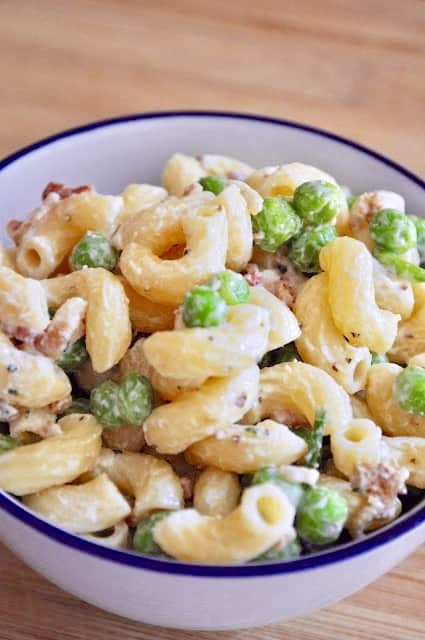 This easy recipe for Bacon Ranch Macaroni Salad has to be one of the best macaroni salads I’ve made or eaten for that matter. 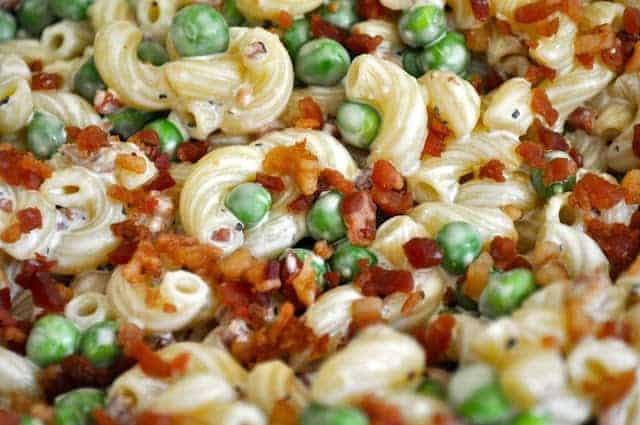 It’s creamy homemade dressing has just enough bacon to keep you coming back for more, chives fresh from the garden and peas because well peas just belong in pasta salad. Put them together and you can see why this recipe is a winner. This recipe started as one of those “hmmm I want to eat this and I can’t find exactly what I want so I’ll make it up as I go along” type of deals. Yeah, I love it when it turns out well and I silently fist pump as everyone asks for more. And when I fail well we all fail sometimes right? But forget about failing with this recipe you can’t go wrong because it’s so easy. One tip though, makes it a day before you plan to serve it because it tastes better the second day. 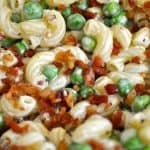 This easy recipe for Bacon Ranch Macaroni Salad has to be one of the best macaroni salads I've made or eaten for that matter. When you make the dressing you can always start with less of any of the herbs and spices, especially the onion powder, make it suit you! I always encourage everyone to taste as they go along and go with your personal taste! That looks so good that I can't make it. lol. I'd probably eat it all in one sitting! it does make a LOT too : ) but I have boys who eat a LOT so it works for me–make it for a BBQ! Perfect summer salad and I normally have all the ingredients on hand. Wow if I made this for a party, it would be the first to disappear!! All those flavors! Looks so yummy! This looks super! I make a bacon ranch potato salad that’s always a hit so I know this would be too!